This morning I drove to Mariposa/Midpines to view the situation. CHP patrols block every western road on Highway 140 from Mariposa to Midpines, and I stopped to speak with the officer stationed at Colorado. From the highway, everything appears normal, except for the dense haze of smoke. While I was stopped, my friends Hugh Carter and Steve Speltz pulled up to check on Hugh's home-it was great to see them. The rumor is Davis Road (our road) remains unaffected, although the main fire still burns less than 1/4 mile away (see map below). With the hot temperatures and afternoon winds, we certainly are not out of the woods yet as the fire is still about only 10% contained and we just learned it jumped to the eastern side of Highway 140, which means we are getting surrounded by the active burn area. I also drove down to Briceburg, where the fire's work is visible from the road. Burma Grade Road, where I walked my dogs just two days ago, has been blackened and smoke still eerily rises in many places. As I stood and surveyed the desolate landscape, ash fell on me. The fire has increased to 26,000 acres--from just 1,000 when it began on Friday. Highway 140 to Yosemite just closed because of the fire spreading. We're still staying at Camp Medley, and enjoying our luxury refugee accommodations. Shad has been assisting Charlie Medley with some home remodeling projects, while Charlie's girlfriend Fen has been cooking us gourmet meals. 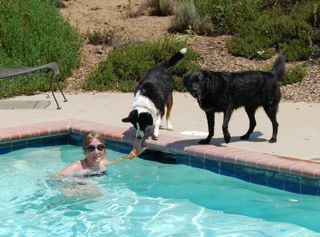 The dogs and I have been enjoying the pool--they accompany me as I do laps. If we are going to be homeless, we're going to do it in style! Last night we lost another Sunshine Hill Pack member. Fatty the goldfish will be buried in a place of honor near our frog pond. Shad has sworn to avenge his death on the stupid target shooter who started this fire. Charlie and Shad completed "Operation Goldfish Rescue" last night and Big G and Jack appear to be doing well this morning. Tonight Mariposa County is holding a community meeting on the fire and we should know more about our situation. My thanks to everyone for your emails and phone calls--who needs a home when we have such great family and friends.